CHINESE: Bai ri hong, Da hua zi wei. HINDU: Jarul, Arjuna, Bondaro, Challa, Ajhar, Varagogu, Moto-bhandaro. INDONESIA: Bungur, Bungur tekuyung, Ketangi. MALAYSIA: Bungor raya, Bongor biru, Tibabah. THAILAND: Chuang-muu, Tabaek dam, Inthanin nam. Banaba is a deciduous tropical flowering tree, 5 to 10 meters high, sometimes growing to a height of 20 meters. Bark is smooth, gray to cream-colored, and peels off in irregular flakes. Leaves are smooth, large, spatulate, oblong to elliptic-ovate, 4 to 8 centimeters in width, 12 to 25 centimeters in length, shedding its leaves the first months of the year. Flowers are 6-parted, purplish lilac or mauve-pink, rarely pink, 5 to 7.5 centimeters across, and borne in large, terminal panicles up to 40 centimeters in length. Petals are oblong-obovate or obovate, shortly clawed, and 3 to 3.5 centimeters long; the margins are undulate and hardly fimbriate. Fruit is a large nutlike capsule, obovoid or ellipsoid, and 2 to 3.5 centimeters long. 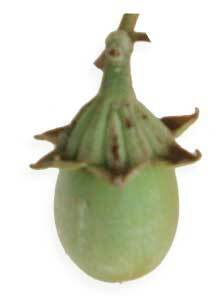 Seed is pale brown, with a wing 12 to 18 millimeters long. - In most or all islands and provinces, chiefly in secondary forests at low and medium altitudes. - Found in the Batan Islands and northern Luzon to Palawan, Mindanao and the Sulu Archipelago. - Cultivated in Manila for its beautiful flowers. - Makes an excellent avenue tree. - Also reported in India to southern China and southward through Malaya to tropical Australia. - Phytochemical screening yielded phenolic compounds, flavonoids, and saponins. - Rich in tannin: fruit, 14 to 17 %; leaves 13 %; bark, 10%. - Studies have isolated: (1) corosolic acid (2) ellagitannin Lagerstroemin (3) gallotannins. - Penta-O-galloyl-glucopyranose (PPG) – identified as the most potent of the gallotannins, with a higher glucose transport stimulatory activity than Lagerstroemin. In addition to stimulating glucose uptake in fat cells, it also has anti-adipogenic properties. - Phytochemical studies on leaves have yielded glycosides, sugars, tannins, proteins, steroids, anthraquinone glycosides, flavonoids, saponins. - Before shedding, the leaves are bright orange or red during which time it is thought to contain higher levels of corosolic acid. - Old leaves and ripe fruit are considered to yield the greatest amount of an insulin-like principle. Twenty grams of old leaves or fruit, dried from one to two weeks, in the form of 100 cc of 20% decoction was found to have activity equivalent to 6 to 7.7 units of insulin. - Mature leaves, young leaves and flowers have an activity that ranged from 4.4 to 5.4 units of insulin per 100 cc of 20% decoction, or equivalent to around 70% of the activity of the leaves or fruit. - Study of the wood yielded no insulin-like principle; the bark and roots yielded a very small amount. - Leaves are considered purgative, deobstructive, diuretic. - Roots are considered astringent, stimulant, febrifuge. - Bark considered stimulant and febrifuge. - Studies have suggested antioxidant, antihypertensive, antidiabetic, antimicrobial, hepatoprotective properties. Leaves, fruits, flowers and bark. - Decoction of leaves of all ages used for diabetes mellitus. Some physicians believe the dried fruit decoction to be better. - Roots have been used for a variety of stomach ailments. Leaf decoction for diabetes; also use as a diuretic and purgative. - Decoction of old leaves and dried fruit (dried from one to two weeks), 50 gms to a pint of boiling water, 4 to 6 cups daily has been used for diabetes. Old leaves and ripe fruit are preferred, believed to have greater glucose lowering effect. Young leaves and flowers have a similar effect, though only 70% that of matures leaves and fruits. The wood has no known glucose lowering effect; the bark, a very small amount. A decoction of 20 gms of old leaves or dried fruit in 100 cc of water was found to have the equivalent effect to that of 6 to 7.7 units of insulin. - In Pahang decoction of bark has been used for the treatment of diarrhea. - Infusion of bark used for diarrhea. - The bark, flowers and leaves used to facilitate bowel movements. - Decoction of fruits or roots gargled for aphthous stomatitis. - Decoction of leaves and flowers used for fevers and as diuretic. - Leaf decoction or infusion used for bladder and kidney inflammation, dysuria, and other urinary dysfunctions. - Seeds considered to have narcotic properties; also employed against aphthae. - Banaba makes a useful timber tree. • Corosolic Acid / Lagerstroemin / Gallotannins: Studies have identified several compounds as responsible for its anti-diabetic activity. (1) corosolic acid (2) Lagerstroemin, an ellagitannin (3) gallotannins, of which PPG – penta-O-galloyl-glucopyranose–was identified as the most potent, with a higher glucose transport stimulatory activity than Lagerstroemin. In addition to stimulating glucose uptake in fat cells, it also has anti-adipogenic properties. • Glucose Transport Activators: Screening has identified lagerstroemin, flosin, and reginin A as activators of glucose transport in rat fat cells. • Diabetes: (1) Banaba has been extensively studied for its application in the treatment of diabetes. Early on, Its ability to lower blood sugar was attributed to corosolic acid, a triterpenoid glycoside, believed to facilitate glucose-transport into cells. (2) Studied with abutra, akapulko, makabuhay for antidiabetic activity through activation of glucose transporter activity. One of the active principles from Banaba was the tripertene, corosolic acid. • Weight loss: Studies in mice suggest an antiobesity effect. It is becoming a common ingredient in weight-loss supplements / products as a metabolic enhancer. • Hypertension: It is also being studied for its use in the treatment of blood pressure, renal and immune system benefits. • Lipid-lowering: Studies in mice suggest a lipid lowering effect - decreasing triglyceride and total cholesterol levels. To date, no toxicity has been identified. • Other studies report potential uses: (1) antibacterial effects from seed extracts (2) significant protection of HIV-infected cells by ellagic acid constituents (3) antioxidative activity of a water extract (4) inhibition of xanthine oxidase by aqueous extract, 31 and anti-inflammatory activity in mice. - Tablets, leaf extracts, capsules, powder and tea in local commerce and the cybermarket. Kakuda T, Sakane I, Takihara T, Ozaki Y, Takeuchi H, Kuroyanagi M. / Biosci Biotechnol Biochem. 1996 Feb;60(2):204-8. Suzuki Y, Unno T, Ushitani M, Hayashi K, Kakuda T. / J Nutr Sci Vitaminol (Tokyo). 1999 Dec;45(6):791-5. Antidiabetes and Anti-obesity Activity of Lagerstroemia speciosa / Guy Klein et al / Evid Based Complement Alternat Med. 2007 December; 4(4): 401–407 / doi: 10.1093/ecam/nem013. Lagerstroemia speciosa extract inhibit TNF-induced activation of nuclear factor-kappaB in rat cardiomyocyte H9c2 cells. / Ichikaw H et al / J Ethnopharmacol. 2010 Mar 2;128(1):254-256. Epub 2010 Jan 4. 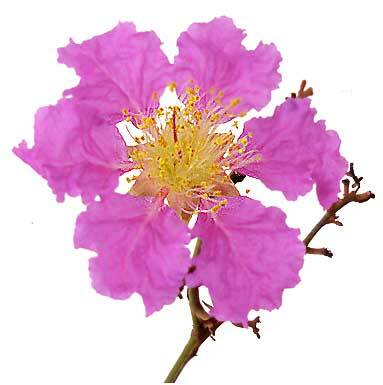 In Vitro Antioxidant Studies of Lagerstroemia speciosa Leaves / Anil P, Manish S, Garvendra RS et al / Pharmacology Journal, Vol 2, No 10, June 2010, Pp 357-360. EVALUATION OF HEPATOPROTECTIVE AND ANTIOXIDANT ACTIVITY OF ROOTS OF LAGERSTROEMIA SPECIOSA PERS. / Pritikumari N Lad et al / IJPRD, 2011; Vol 3(6): August 2011, pp 110 – 117. Effect of Polyherbal Formulation in Obesity Associated Diabetes / Patil Monoj N et al / International Journal of Pharmacy and Pharmaceutical Sciences, Vol 2, Suppl 3, 2010, pp 180-186. 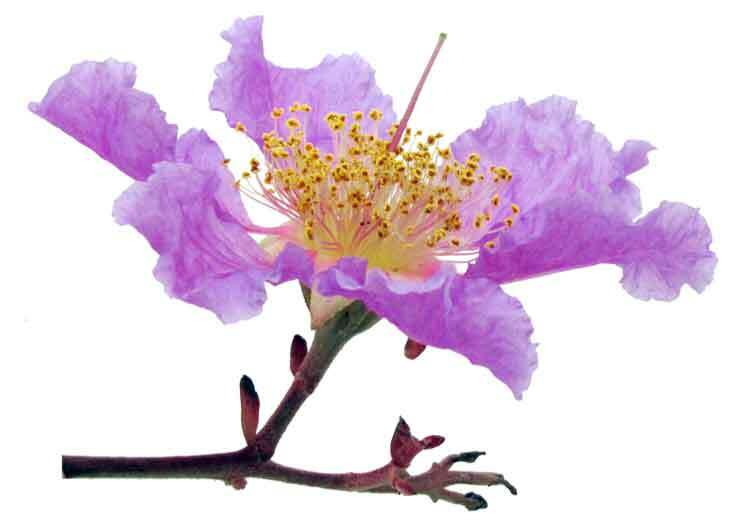 A review of the efficacy and safety of banaba (Lagerstroemia speciosa L.) and corosolic acid. / Stohs SJ, Miller H, Kaats GR. / Phytother Res. 2012 Mar;26(3):317-24. doi: 10.1002/ptr.3664. Epub 2011 Nov 17. 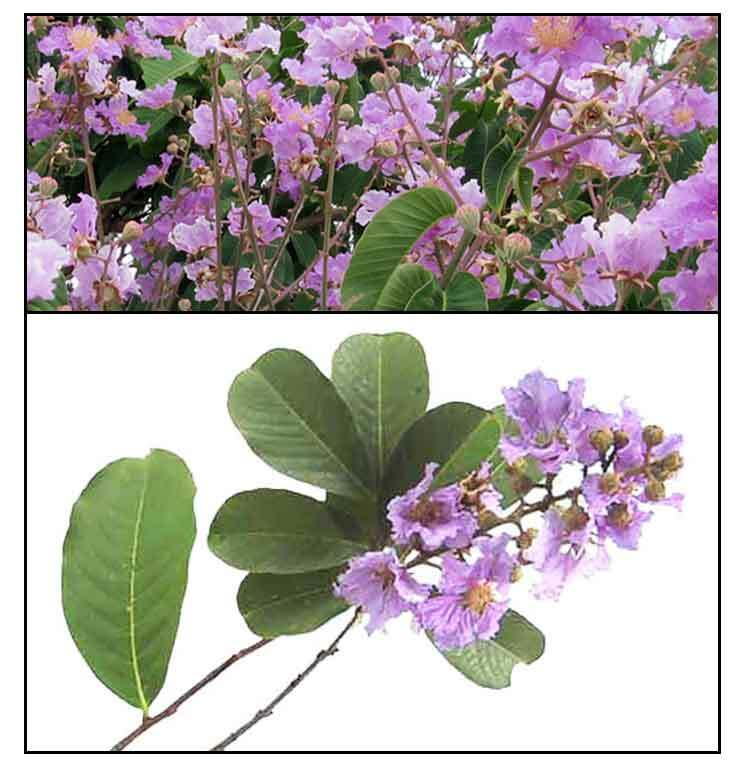 Phytochemical and antibacterial study of Lagerstroemia speciosa (L.) Pers. and its ethnomedicinal importance to indigenous communities of Benguet Province, Philippines / LMV Laruan et al / Indian Journal of Traditional Knowledge, Vol 12(3), July 2013, pp 379-383. GLUCOSE UPTAKE-STIMULATORY POTENTIAL OF COROSOLIC ACID: A MECHANISM BASED REVIEW / Gitanjali Mishra, Prasanna Kumar Panda, Trilochan Satapathy*, Suresh Kumar Ghritlahare / Indo American Journal of Pharmaceutical Research (2016) Vol 6, Issue 8.